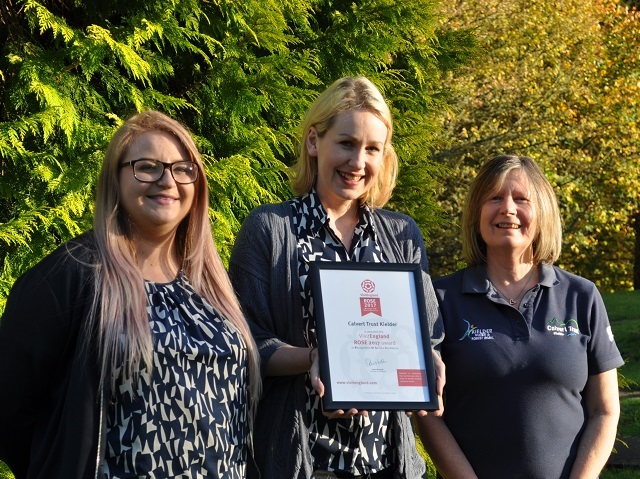 Calvert Trust Kielder has been awarded a 2017 VisitEngland ROSE award in Recognition of Excellent Customer Service. This new VisitEngland award is given annually to just 100 VisitEngland quality assessed accommodation businesses that go the extra mile in order to provide excellent customer service. And as this is the first ever year that this award has been presented, we feel extra extra special. Nominations were triggered following our annual VisitEngland quality assessment but other evidence, including online customer reviews, were taken into account. The final judging panel also looked for innovation that sets our business apart. This included facilities or services offered to make the customer’s stay really special. “A lot has changed since I arrived at Calvert Trust Kielder in the winter of 1988. I was almost 30 years younger for one. Buildings, including 13 Chalets in the beautiful Kielder Forest have since been built, over 20 different outdoor activities and experiences have been created, over 50 people have been appointed to our team and around 150,000 people have visited us. Awards like this feel great, not just for the amazing and dedicated team of which I am personally so proud – but for our visitors. Here at Calvert Trust Kielder, we don’t always communicate how hard we try to ensure that all our visitor experiences are memorable and uplifting, so it is lovely that some very significant people are noticing with no pomp and circumstance from us. We are very grateful."